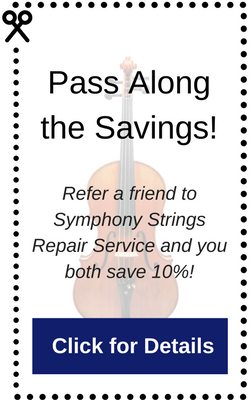 Refer a friend to Symphony Strings Repair Service and you both save 10%! Be sure to write your name on the business card or rack card before sharing. Print clearly so we are sure to give you the correct savings. Share this page with your friends. Have them fill out the form below to get the savings. Each client is limited to one 10% offer as the “new” client, and one 10% offer per repair service as the “current” client. Parts, supplies, taxes, or other third-party fees will not be included in the discount. If one “new” client is referred by multiple people, the discount will be applied or not applied at the discretion of Symphony Strings, LLC. Discounts not used within 90 days will expire.